Swing doors can be fitted as part of a new installation, or as an upgrade of an existing door from manual to automated. Adding a swing mechanism to a manually-operated door gives it a new look and a new use. Lightweight interior doors and heavy, traditional doors can be given an automated swing capability. More suited where footfall is lighter or internally to replace heavy doors with a lighter, user and wheelchair-friendly version, swing doors can be individually configured to meet specific and differing needs within the same building. Swing doors are ideal in the workplace, in care and nursing homes, in community centres or where comings and goings need to be monitored. They suit public buildings, hotels, hospitals, airports and also commercial and industrial environments. 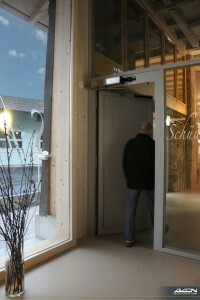 Swing doors can be opened automatically or via a control switch. We can advise as to the best type for your needs. See brochure pdf for full installation and configuration options.